Tucked away in the northern most point of Old Marco is Cafe de Marco, the island’s favorite restaurant for the most diverse selection of fresh seafood available. Our building enjoys a rich piece of Marco history. The Cafe’s building was the original quarters for the chamber maids employed by the historic Old Marco Inn just a few yards away. In the early 1900s the Inn functioned as a “bed & breakfast”, and the maids would simply walk to work from our building. This explains the answer to a frequently asked question…”Was this an old house at one time?” Today, step inside to what has been transformed into an islander’s tradition. We have proudly served a generation of visitors from all over. 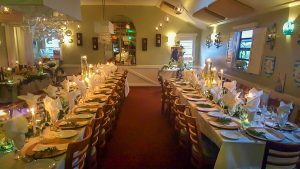 Established in 1983 by owner/operator Sandy S. Franchino, this award winning bistro is well noted for its vast array of fresh seafood, prepared daily with her chef’s original recipes and sauces. Cafe de Marco is a seven time winner of the Platinum Plate Awards for best seafood and appetizers on Marco Island. The emphasis has always been on “consistency”, keeping with the Cafe’s high standards for using only the freshest and superior quality of ingredients. There is a non seafood selection available for our “land lovers,” as well as individual requests for those needing certain diet restrictions fulfilled. Vegan, vegetarian and gluten free options are readily available.The house trademark since our inception is the Jumbo Prawns. These huge shrimp are seasoned with fresh herbs and spices, broiled in garlic butter and served over rice pilaf. Another shrimp staple to the menu is the Shrimp Lenny (named after Sandy’s father). This creation has been copied by many, but never successfully. It combines large shrimp with crabmeat and bacon, broiled to perfection and draped with our hollandaise sauce. Among other popular seafood recipes are our Chilean Sea Bass, local Black Grouper de Marco, Assorted Captain’s Platter, Snapper Almondine, and our Jumbo Lump Blue Point Crab Cakes. Our land lovers may select from a variety as well. Such items include: a l2oz. New York Strip Steak, Filet Mignon, Rack of Lamb or Chicken entrees. All entrees are complete with vegetable, pasta or potato, garden salad, rolls and butter. The award winning appetizer of Oysters Rockefeller is not to be missed, along with the Seafood Sampler. This dish comes complete with shrimp cocktail, stuffed mushrooms, clams casino, oysters Oscar and Rockefeller. Desserts are also given special attention at our Cafe. As Sandy’s favorite course of the meal she has created “The Cafe Puff” which has mouths drooling from first to last bite (if you can finish one!). Other homemade desserts include Italian Ricotta Cheese Cake, Chocolate Molten Lava Cake, Cannoli and Florida’s own Key Lime Pie. With an original menu of this caliber, it’s no surprise that folks have been returning to our Cafe year after year since 1983! To parallel our vast menu, our Wine List is equally outstanding. Our manager and wine consultant, Mr. Scott Terres, takes great pride in continually updating and revising our wine list to include Wine Spectator’s top choices for a complete listing to satisfy the most discriminating of palates. He also shops that small vineyard’s prize creation to allow guests the enjoyment of a product not easily found. He is available to happily educate and guide any guest requesting info on any wine to help compliment their fine meal selection. Our experienced wait staff is also well trained and constantly schooled to all updates on food and wine specials. Many team members have been with us for over 15 years! 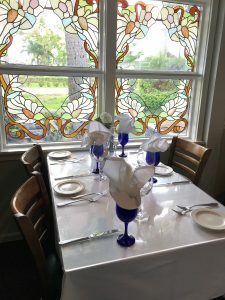 Part of the charm of our intimate bistro, includes an outdoor courtyard dining area, perfect for typical Florida evenings! Equally unique to Cafe de Marco is the family spirit found here from our staff right on through to Sandy’s own family which flanks the restaurant on any given night. It is sometimes hard to distinguish between staff members and family members. All who arrive here are treated as family and before leaving feel right at home, having made a lasting memory while dining on Marco. Cafe de Marco may be a bit hard to find, but oh what a discovery! With a reputation which precedes us, it is our quality that defines us.